Caesar will take over from Sid as the Club's new mascot following a seven-year stint. First there was Scragger, and then came Sid, but a new king was crowned at Etihad Stadium on Saturday night. After many years of loyal service, the beloved club mascot retired; the nine-year-old British Bulldog gracefully stepping aside on the weekend to make way for the aptly named, Caesar. 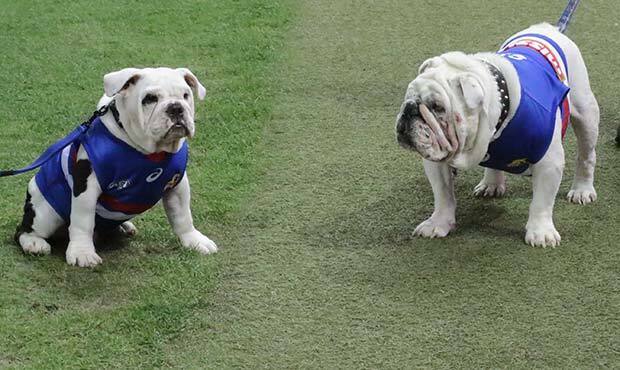 While Sid boarded a golf cart and rounded the boundary to the applause of his many, many fans, Caesar was held aloft, Lion King-style, to be anointed as the next screwed-up face of the Western Bulldogs. Tanya Templeton, one of the four-month-old British Bulldog’s owners told the 45,000 strong crowd that Caesar was born to play the part.